India achieves yet another public health milestone; becomes first country to be declared free of Yaws, an infection of the skin and bones, much ahead of WHO global target year of 2020. 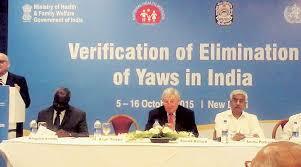 India has acknowledged as the first country in the world to become YAWS-free. Union Health Minister JP Nadda received an official citation from the World Health Organisation and the UNICEF for Elimination of Maternal and Neonatal Tetanus and for being YAWS-free on Thursday. YAWS is a kind of bacterial infection that affects skin, bones and joints, while tetanus, another bacterial infection, leads to muscle spasms that can be fatal. An official statement said, "India was validated for MNTE in April 2015, much ahead of the global target date of December 2015." According to the WHO, 19 countries have still not reached the MNTE status.